I’ve put together some ‘tips on buying a caravan’, and there are a number of things to consider. For instance, are you intending to travel mostly on sealed roads, or do you require a van that can go off-road? If you know you will only be travelling on sealed roads, most caravans are suitable for this purpose. However, beware if you intend to wander off-road, or even onto the odd gravel track. Standard chassis and suspension will not cope with the extra strain and bashing these rough roads dish out. Having said that, and provided care is exercised; most stock standard caravans are able to travel on rough corrugated roads for short distances without suffering too much damage. I mean short distances… 20-50 kilometres, not 300 kilometres! 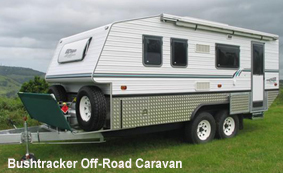 Off-road caravans have higher clearance from the ground, combined with heavy-duty suspension and chassis. This enables them to travel through creek beds and over rough rocky terrain, and cope with the harsher road conditions, reduce dust and water entry. They generally have larger water tanks, a space for extra fuel cans, spare wheels, two gas bottles and windows are tinted to cope with hot temperatures of the outback. If you lack commonsense, don’t take a caravan into remote areas or the Outback! Always monitor weather conditions so you don’t become stranded, watch and read the condition of the road, and keep a close eye on the van. Collect intelligence from local people, research your trip, and if roads deteriorate and your van is getting a hammering… go back. What are you buying a caravan for? Are you planning long trips, short trips, with kids, without kids, staying mostly in caravan parks? By answering some of these questions, it will determine what size caravan you need, what sort of features it should have and the layout that will suit you best. As a general rule the smaller the caravan the easier it is to tow. Mostly importantly, bear in mind your vehicle’s towing capacity when buying a caravan. How long do you intend to live in it? How many people will sleep in it? Will you be travelling on the road, off road or on 4×4 tracks and trails? Do you require alternative power, such as solar panels and dual batteries? Do you require an on board toilet and shower? Will you require an awning or full annexe? Do you intend to cook inside, outside or both? Do you require plenty of storage for personal items? Will you be carrying bicycles and other large objects? Do you intend using it at home for additional accommodation? Is height a major consideration for storage? You will need to consider the following information when purchasing a van. The tow vehicle’s allowable (braked and unbraked) towing weight. The tow ball weight rating. Any additional equipment required for towing, such as the fitting of a transmission or power steering oil cooler in your tow vehicle. Manufacturer specifications for the type and rating of the tow bar required for specific towing weights. *Tare is the weight of the caravan after manufacture (this is also considered a dry weight). Gross is the all-up weight the axles are legally allowed to carry.The difference (weight rating) between tare and gross varies from manufacturer to manufacturer so ensure you always check this. This list is only a few suggestions when buying a caravan, and you should really develop your wishlist in conjunction with realities of towing capability, budget, height or other limitations. Check for rust, especially around the chassis area, and underneath the van. If there is fresh paint there then it could be the sign of a quick cover-up. Rust is a big problem with caravans and is very expensive to fix. Check everything, from the cooker to the fridge, beds and windows, if you don’t you’re bound to find something that bites you later on. Even if there is nothing major to be found, minor hitches can be a good way to bargain down price. Water leaks and damp. Check for leaks from any pipes in the van, also look around windows and the roof for signs of water damage and thus signs of leakage. If there is a smell of damp in the air then there could also be a problem. A leaking caravan is a miserable place to be. Check the tow hitch, make sure it moves easily and that the handbrake holds the van when on. You don’t want to be slithering down the hill into the lake now do we! Is the van the right size for you, can it fit the kids and yourselves without getting cramped? Check to make sure the van is not too big for your car. Causing stress to your car pulling a large van is a quick route to expensive engine problems. If you’re new to caravanning then make sure you take a test pulling the van before you go on your holiday. Towing a caravan calls for a very different and more cautious approach to driving. As with most second hand items, always view a good number before making a decision, chances are the first one isn’t going to be the best deal. Don’t get goaded in by the seller trying to force a quick sale by suggesting there are hoards of other buyers just waiting to snap up their dodgy caravan. Haggle if possible, and don’t start at the price you want to pay, always start well below and bargain up. If you’re not sure whether a caravan is for you, rent one for a few weeks to see if the life-style suits you, before buying a caravan. Buying a used caravan is essentially a case of ‘Buyer Beware’. The onus is on you to make sure the caravan is sound, it’s a good idea to get an experienced person or caravan dealer to give the caravan a thorough inspection. When viewing a caravan you should satisfy yourself that the vendor is knowledgeable about the caravan and has a legitimate reason for the sale. Ask yourself whether the price is similar to other caravans on the market – if a deal looks too good to be true it probably is. You should always arrange to view the caravan at the seller’s home address and never in a car park or other public location. Check that the vehicle’s identification numbers stamped into the body work, or on the chassis plate matches registration papers. Don’t get caught buying a caravan that is stolen! This is a start, and the this page on tips on buying a caravan is a start… buying is a big investment, so ensure you research thoroughly. Caravan WA is a great place to visit to plan trips and gather general information about traveling in Western Australia.